Will the Sale of 'Yellow Jackets' Spur Sales in France in December? EMU retail sales volumes are up in October by 0.3% after falling by 0.5% in September. The sequential growth rates from 12-months to six-months to three-months do not show any sign of pick up. Nonfood purchase volume has been stronger and steadier, however. Nonfood volumes also are slightly firmer in their quarter-to-date pace for Q4 (a highly tentative calculation at this point). Vehicle registrations are up in October but only after a plunge in September. This volatile series, however, has been showing 12-month to six-month to three-month erosion and vehicle registrations are down sharply in the quarter-to-date. 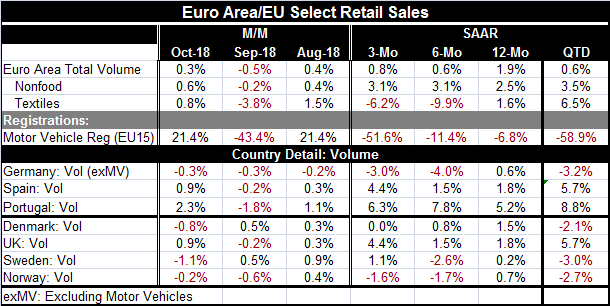 Among the three EMU reporters, Germany, Spain and Portugal, sales volume trends are mixed. Germany shows a rough deceleration with sales contracting over both three-months and six-months. Spain's pattern is mixed but with stronger sales over three months than over 12 months. Portugal shows sales in the firm-to-strong camp with three-month sales at a 6.3% pace, quite strong for volume and well above their 12-month pace of 5.2%. Ironically, Germany, the usual strong economy of Europe, is running a policy to produce a fiscal surplus and that is contributing to exceptionally weak domestic retail sales. Among the next four European reporters, three have sales declines in October and two show declines in September. But sales trends are only weak or decelerating in Denmark and Norway. In the U.K., sales actually show some acceleration with the three-month gain at a pace of 4.4%, well above the 12-month pace of 1.8%. In Sweden, the trend for the pace of sales is unclear and the pace itself has been slow. Quarter-to-date among these seven reporters, sales are lower in four of them and that includes Germany. However, the U.K., Spain, and Portugal each show sales increases quarter-to-date. For now these calculations entail October sales divided by the Q3 average for sales properly positioned and compounded. These figures almost certainly will not stand for the quarter, but they do show Q4 off to a poor start. Of course, the U.K. is only just still in EU or is that not right? With a European court ruling that the U.K. Brexit vote is reversible and with such division in the U.K. over accepting the version of Brexit that is on offer, some are hiking the prospects for a new Brexit referendum and the potential for a result to 'remain' rather than to 'leave.' For the moment, BOE head Governor Mark Carney is coming under fire for the bank's highly downbeat assessment of prospects for the U.K. economy in the wake of leaving the Union. Earlier the National Institute of Economic and Social Research (NIESR) had put forth estimates showing weaker long-term growth in the wake of leaving the EU as well. All estimates by economists I have seen look for weaker economic performance for a U.K. outside of the EU than for one that stays inside. Leavers who extoll a brighter future must have borrowed a bin of napkins from U.S. economist Art Laffer, who famously drew his 'Laffer curve' on a cocktail napkin to demonstrate how growth and tax revenues could surge after a tax cut. Perhaps Mr. Macron, too, may have ordered some of these napkins by this time. The Italians seem to be using bundles of them. Who needs data when you can just make it all up and get the exact result you want? Since when is reality a vital part of economic policy making?